Código interno: 1115956. Faro izquierdo RENAULT TWIZY Technic, Año: 2014. Referencia : 260101315R. Wir können es überprüfen. Nous pouvons le vérifier. Código interno: 1115957. Faro derecho RENAULT TWIZY Technic, Año: 2014. Referencia : 260101315R. Wir können es überprüfen. Nous pouvons le vérifier. Renault Twizy. LaAnillo Rectangular Faros antinieblas son luces de slim-line para montaje de parachoques o spoiler. Son fáciles de montar y son los soportes y lámparas halógenas. Anillo Rectangular antiniebla luces Info Extra. Renault Twizy. Perfecto para las noches de invierno, de superior calidad alto impacto ABS tan no aherrumbrará. Un par de anillo de calidad nuevo estilo automotriz lámparas de Spot Reino Unido, diseñado y fabricado en el Reino Unido. 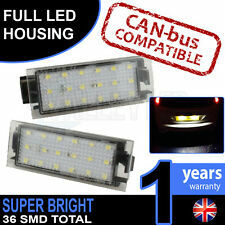 2 placchette a led per le luci targa 18 led canbus 6000k (destra e sinistra). - Temperatura colore: 6000K (luce bianca). - Led presenti su ogni placchetta: 18 SMD. Renault Twizy. Perfect for the Winter Nights, Made from top Quality high impact ABS so will not Rust. For mounting above or below the bumper, complete with 2 x 12 volt 55 watt H3 'E' approved powerful Halogen bulbs. Renault Twizy. LaAnillo Rectangular de conducción luces son luces de slim-line para montaje de parachoques o spoiler. Son fáciles de montar y son los soportes y lámparas halógenas. Anillo luces de conducción Rectangular Info Extra. Renault Twizy. Matt headlights present a serious safety risk. In addition, naturally, clear and well maintained headlights also contribute to the appearance of the vehicle and, thus, the value retention. Renault Twizy MAM. LED SMD KENNZEICHENBELEUCHTUNG. Renault Twingo II 2 CN0. Renault Twingo III 3 BCM. Renault Trafic III 3 Bus JG. Renault Trafic III 3 Kasten FG. Renault Espace initiale V 5 JR. Renault Vel Satis BJ0. Renault Twizy. Kit de Restauración Faro. Características y ventajas Faro Polaco Utilizando el kit de restauración de faros QUIXX, mates y amarillentas luces son restaurados otra vez como nuevo! El kit contiene todo lo que se requiere para un resultado profesional. Good Quality set of halogen headlight bulbs suitable for: Renault Twizy, Manufacture Dates: [2012 to 2017]. Generally it does not matter what the engine size or vehicle body type is. Renault Twizy. TheRing Rectangular Fog Lights are slim-line lights for bumper or spoiler mount. They are easy to fit and include halogen bulbs and brackets. Ring Rectangular Fog Lights Extra Info. Ring Rectangular Fog Lights. SCHEIBENWISCHER FRONT. 1x Reflektor. SCHEIBENWISCHER HECK. Renault Twizy MAM_ (2012-2018). Klimaanlage & Heizung. Renault Trafic II Bus JL (2001-2018). Renault Trafic II Kasten FL (2001-2018). Renault Trafic III Kasten FG_ (2014-2018). Renault Twizy MAM_ (2012-2018). Rojo trasero parachoques del reflector para RENAULT MASTER II TRAFIC 2 III 3 TWIZY MAM_. Renault twizy MAM_ 45 2012/04-2018/12 4 KW, 5 CABALLOS DE FUERZA. Renault twizy MAM_ 80 2012/04-2018/12 13 KW, 18 CABALLOS DE FUERZA. Renault Twizy. TheRing Rectangular Driving Lights are slim-line lights for bumper or spoiler mount. They are easy to fit and include halogen bulbs and brackets. Ring Rectangular Driving Lights Extra Info. Renault Clio IV 4 BH. Renault Clio Grand Tour KH IV 4. Renault Clio IV 4 cajas. Renault Clio III 3 BR0 / 1, CR0 / 1 del 2007. Renault Clio III 3 box SB_, SR del año 2007. RENAULT ESPACE INICIAL V 5 JR.
Renault Twizy MAM. Mit integriertem widerstand. 2x TOP LED SMD KENNZEICHENBELEUCHTUNG. Set aus 2 Modulen mit je 18 LED's. Mit E-Prüfzeichen,damit eintragungs und zulassungsfrei! Twizy (Typ MAM_) - alle. Vel Satis (Typ BJ0_) - alle ab Modelljahr 2005. Clio 3 / III (Typ BR0/1 ; CR0/1) - alle ab Modelljahr 2006. Laguna 2 / II Limousine (Typ BG0/1_) - alle ab Modelljahr 2005. Clio 4 / IV - alle. Number plate light for Renault Twizy 2012-2018 The experts in Automotive Lighting. - Bulb type: W5W. - Clear number plate light. Rear Lights. - Bulb included. - Bulb holder included. - Body type: Hatchback. Renault Twizy MAM. 2x TOP LED SMD KENNZEICHENBELEUCHTUNG. Set aus 2 Modulen mit je 18 LED's. Mit E-Prüfzeichen-Zulassungsfrei! Renault Vel Satis BJ0_ (2002-2018). Renault Twingo II CN0_ (2007-2018). Código de matrícula de iluminación para RENAULT VEL SATIS TWINGO tráfico III 3. Renault Vel Satis BJ0_ 2.0 16V Turbo 2002/06-2009/12 1998 CC, 120 KW 163 CABALLOS DE FUERZA. • RENAULT TWIZY à partir de 04/2012. • RENAULT SYMBOL 2 et THALIA 2 à partir de 09/2008. • RENAULT TWINGO 2 de 03/2007 à 10/2014. • RENAULT TWINGO 3 à partir de 10/2014. 2 éclairages de plaque à LED blanche. UNA PLACA LIGERA TIPO ORIGINAL RENAULT VEL SATIS - DEJA 4/2005 ANTES. Una iluminación de la placa de tipo de fuente. RENAULT CLIO 3 fase 2 05/2009 al 11/2012. RENAULT CLIO 4 IV desde 11/2012. RENAULT KADJAR desde 06/2015.